As parents, we often claim that whatever we do, we do for our kids and, as far as our awareness goes, that is true. But parents are human, which means our decision-making involves mostly emotional reasoning and subconscious values, beliefs and needs, which our mind cleverly re-dresses as calculated choices. Sometimes, life hands us a rare opportunity to become aware of our choices of lifestyle. These are typically unpleasant, but they still get the job done. Ronit and I have written before about our own baby losses and about our friend’s near-death experience. 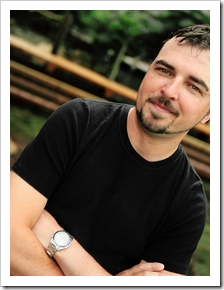 During my time on Twitter, I bumped into a social media superstar called Scott Stratten. Normally, Internet marketers tend to be pushy, self-absorbed characters and I quickly tire of them and move on, but Scott has adopted an “unmarketing” approach and made that his brand, under the slogan “Stop marketing. Start engaging”. So I started following him and enjoyed his posts and video clips for a while, until at some point, I saw some of his posts on parenting. As it turns out, his family life is a little harder than most, but he handles it with bravery and grace, which I find inspiring. In his post 25 Things You Didn’t Know About Me, one of the most important things on the list is “My girlfriend and son were in a car accident December ’07 while I was at my Nanny’s (aka Grandmother) funeral. He walked away unscathed, she lives in constant pain and has partial brain damage and it kills me every day that I can’t fix it or I can’t go punch the woman in the mouth who ran the red light”. This week, I saw a talk Scott Stratten gave at TEDx, which made me choke. My son Tsoof was watching it over my shoulder and felt the same. Although it is difficult to learn from other people’s experiences, I really hope this will hit the right spot for you, for your kids’ sake. And for those of us who don’t speak Polish, Andzej wrote something like “Career is not worth spending most of our time traveling away from the people on whom we depend and nothing will change that. It’s not” (adapted from Google Translation). I’m glad you liked, Andzej. dziękuję. I have to admit that this video literally stopped me. In the middle I realized that I sit with my cup half way in the air watching. After all that happened to have the strength to go public and talk about that with such humor and distance to it and to itself is an incredible thing to do. kariera nie jest warta spedzania wiekszosci czasu w podrozy z dala od ludzi na ktorych nam zalezy i zadne fb tego nie zmieni. to nie to. We are to keep going, sure. We are to achieve great things, sure. We are to get where we are, sure, but… lets all stop form time to time to check the direction.